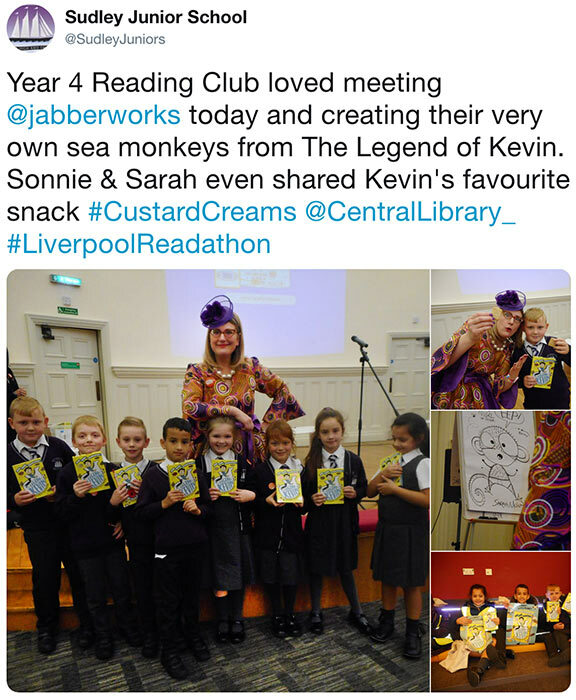 These two weeks, Liverpool readers have been abuzz with the Liverpool Readathon!! 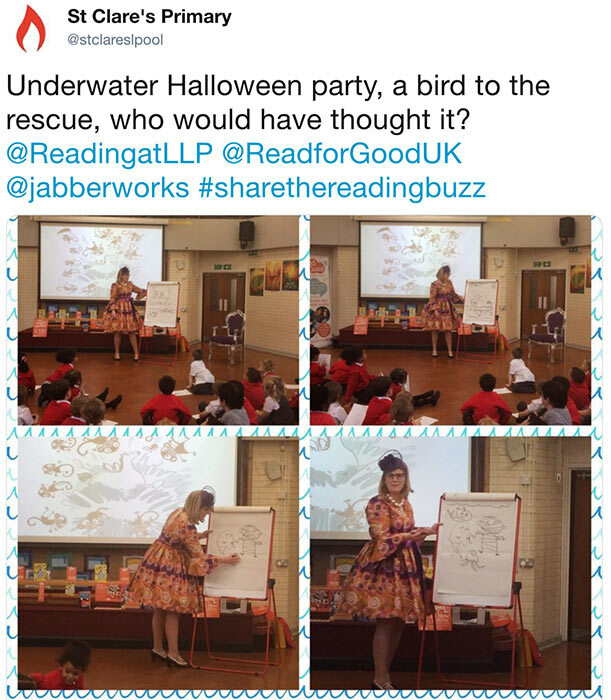 I'm a patron of Read For Good, a charity that runs sponsored Readathons in schools to get books and storytellers to kids in hospital. 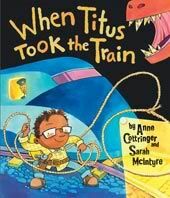 The whole idea of kids helping kids really motivates kids to read, which is great! 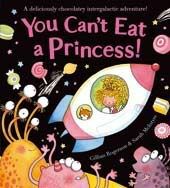 And it's reading for pleasure, so they can read whatever they like, which is the best way to create readers for life. 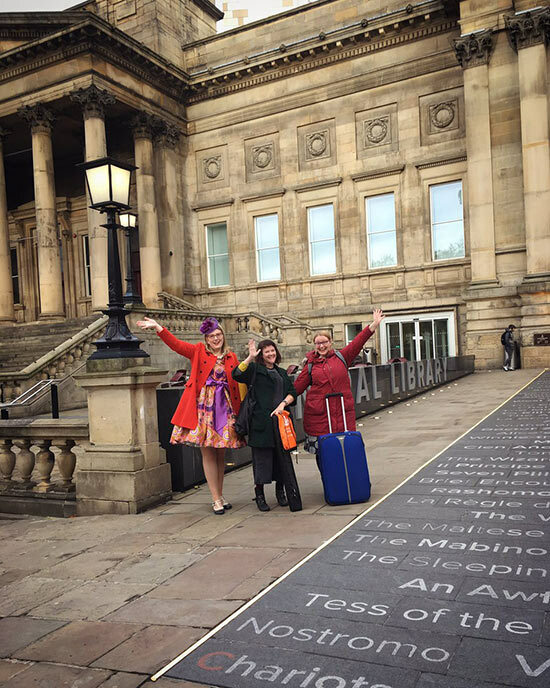 Here's our team outside gorgeous Liverpool Central Library: me, Annie Smith from Read For Good, and Jenny Holder from Liverpool Learning Partnership, whose partnership made the whole thing possible! And it's not over! 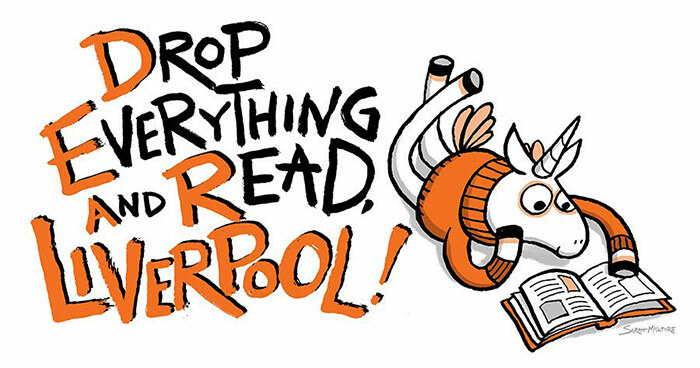 This FRIDAY at 2pm, people across Liverpool are going to Drop Everything And Read! 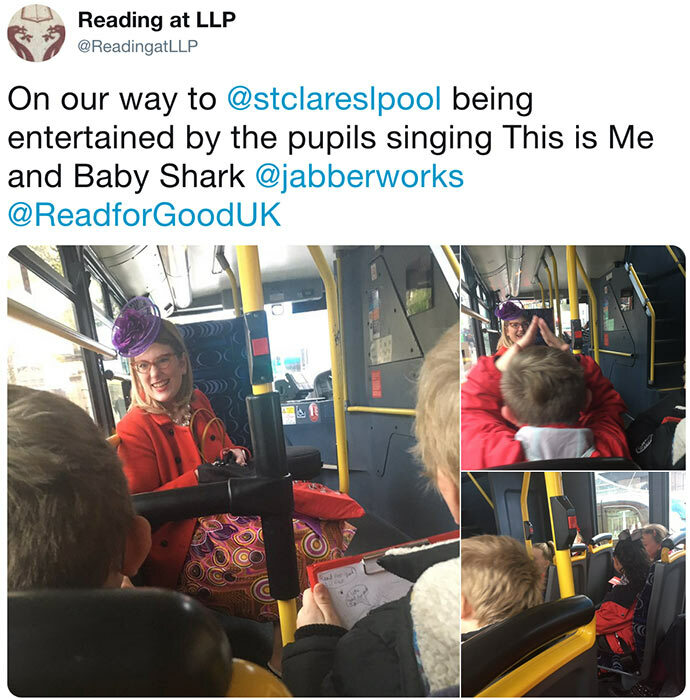 Liverpool pride themselves on being a City of Readers, and there's nothing more powerful for kids to see than grownups reading, too. 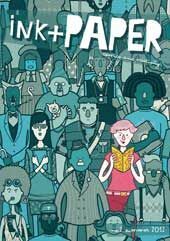 During my visit, I went with Jenny and Annie to a 'Teachers as Readers' meeting, an project set up by the UK Literary Association's Teresa Cremin. 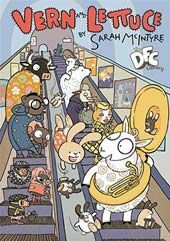 The idea is that a lot of teachers would love to share from the huge range of diverse picture books out there, but they're so busy that they often fall back on only using books from their own childhood, or books by the big-name celebs. 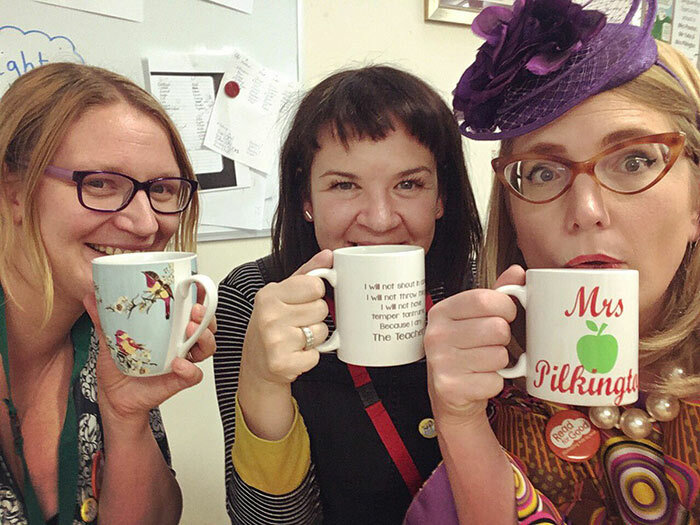 Meetings are springing up all over the UK, and tables filling with picture books for teachers to look through and discuss. 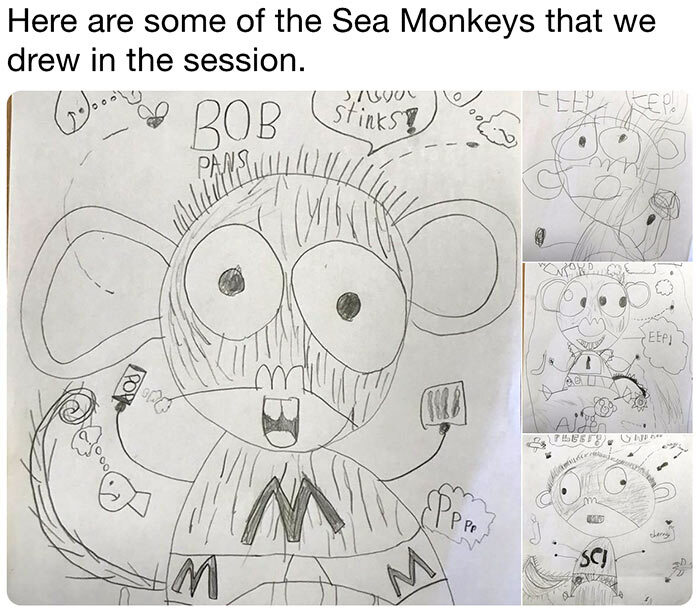 At the end of this meeting, I talked a little bit about my books (Dinosaur Firefighters and The New Neighbours) and showed them how to draw a Sea Monkey. 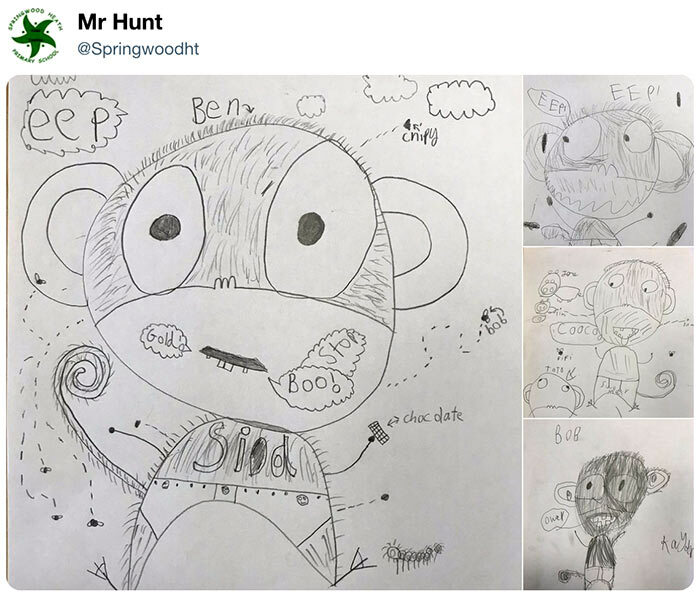 I also talked a bit about the Pictures Mean Business campaign, and how kids gain another potential hero when teachers focus on the illustrators of books, and analyse the pictures as well as talking about the books' writers and words. And I got to spend a day in Liverpool! 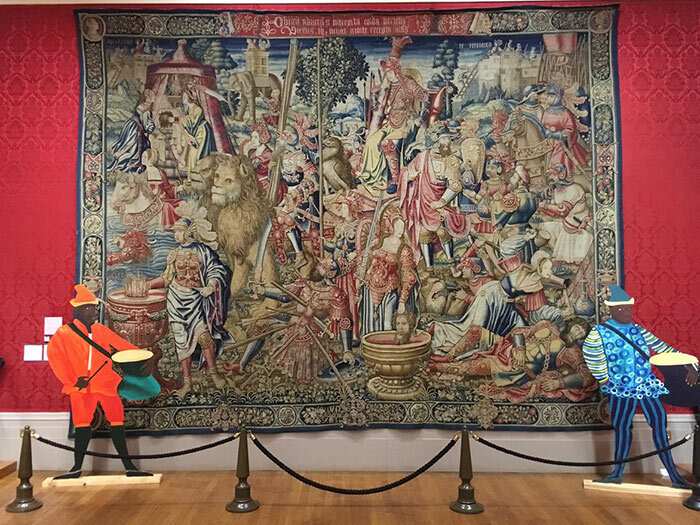 During my last Readathon visit, I only ever had free time when the museums were closed, so this time I vowed to come early and have a good run around. 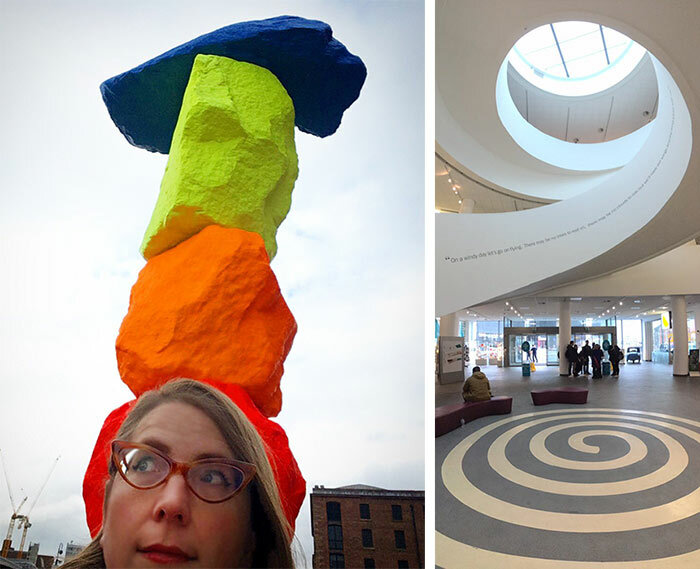 Liverpool is incredible, with amazing architecture and so many world-class museums. Here was one of my stops, the Tate Liverpool. 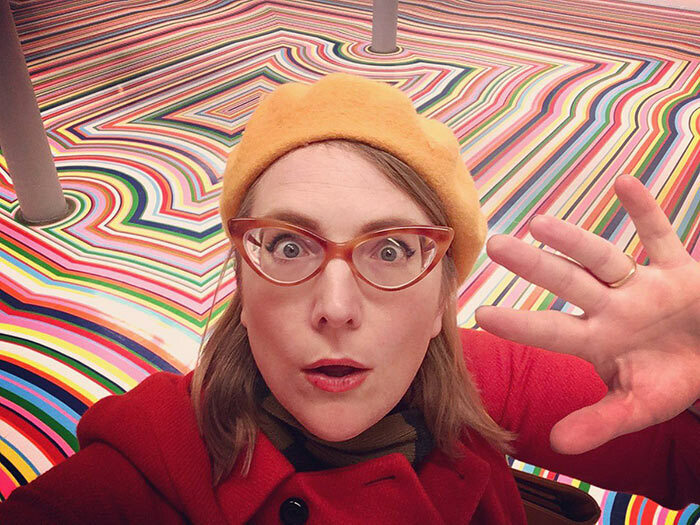 Check out the colourful floor by Scottish artist Jim Lambie! 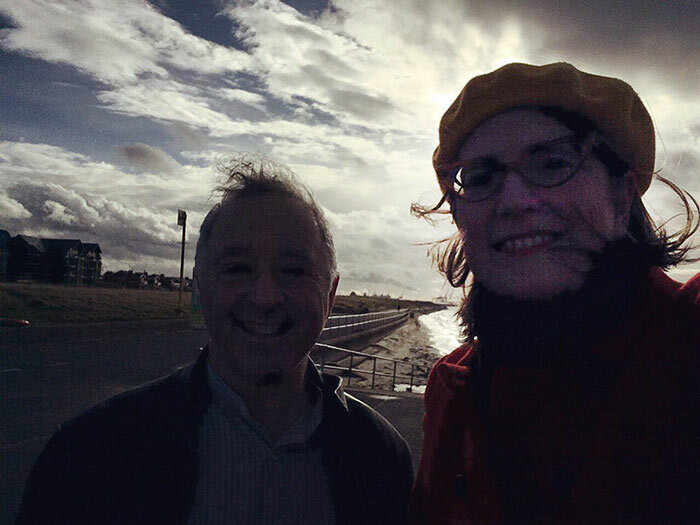 One of the absolute best parts of my trip was going to stay with local author Frank Cottrell-Boyce, his wife Denise, and their family. I only really knew them from quick conversations at book festivals, so it was great getting to have much longer chats. 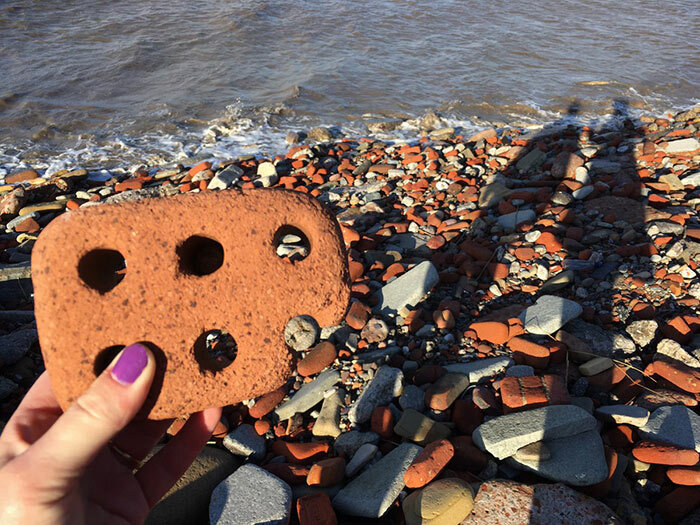 In the morning, Frank took me for a good long walk along the beach, where we could see the dockyard cranes, the Anthony Gormley statues sticking out of the waves, and huge freighter ships passing by. I didn't get a chance to take photos, so I'll do a tour of the schools' tweets about the events! 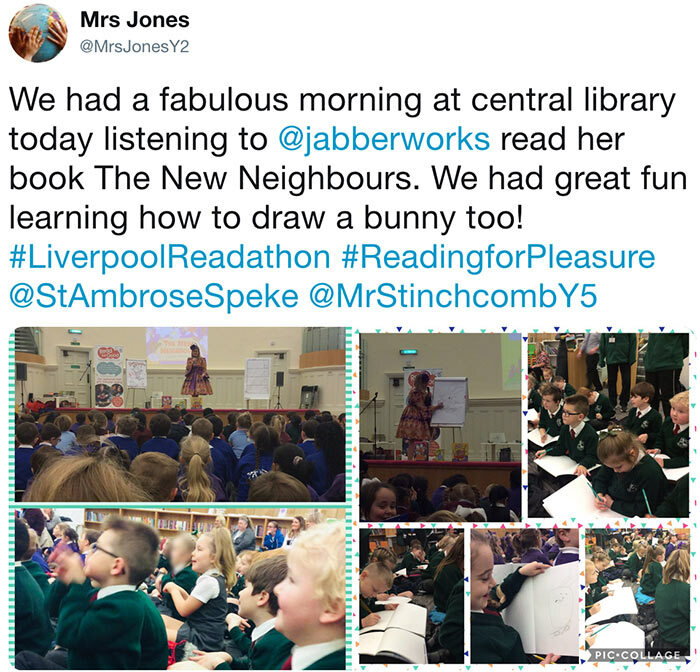 Here's one from my event with the younger primary schoolchildren, where I talked about The New Neighbours, drew bunny characters, and they helped me design an animal tower block. 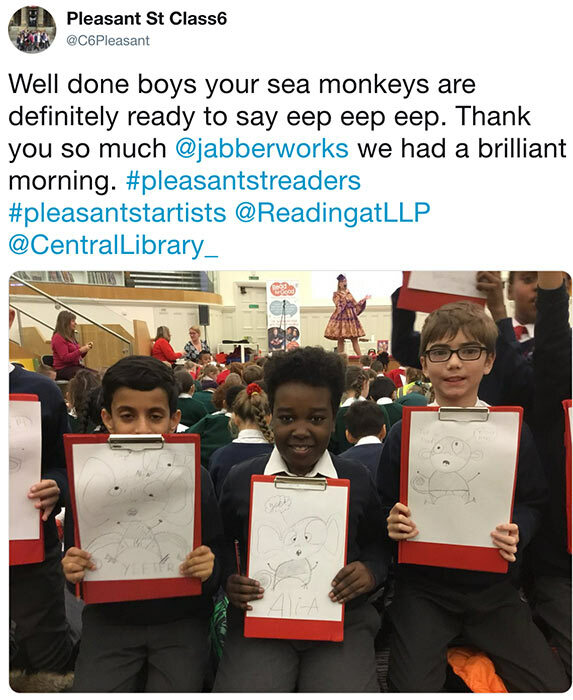 And here are a few from my event with the older primary children, where I read a bit of The Legend of Kevin by Philip Reeve and me, showed them some of my illustrations, and led them in drawing Sea Monkeys (who make a memorable appearance in the book). 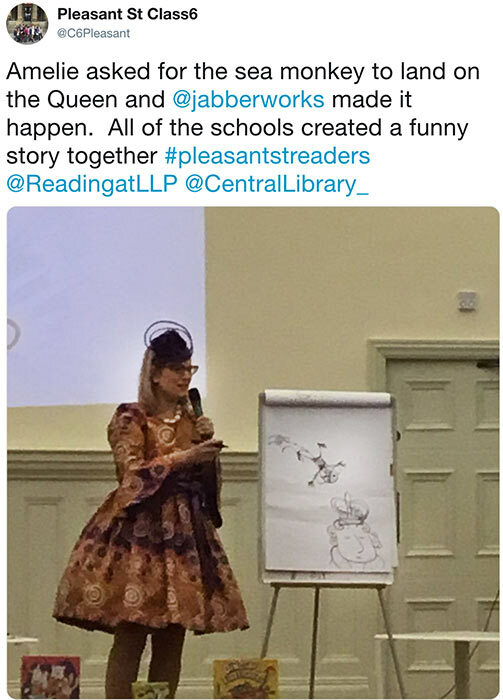 They also led me in making up a funny story of our own, involving the plunge of a Sea Monkey and pigeon from Big Ben onto the Queen and her cavalcade. 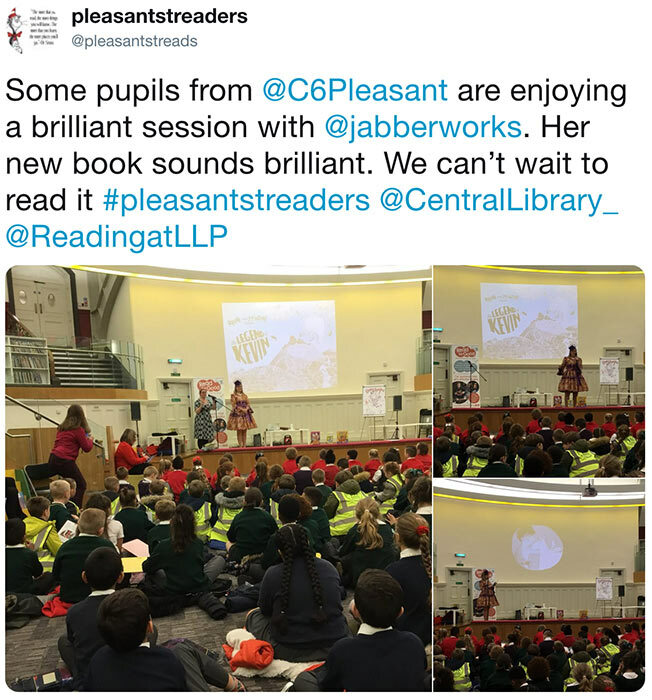 Big thanks to Liverpool Central Library and the staff of St Clare's for hosting me, and to my amazing team of Jenny and Annie, for organising everything, and making it run so smoothly and be so much fun! 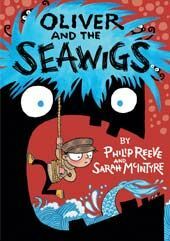 This week they're bringing author Phil Earle to Liverpool for the Readathon, and I know that will be amazing. 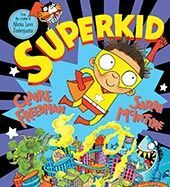 If you'd like to find out more about how you can help Read For Good and getting books and storytellers to children in hospital, here's a great little video. 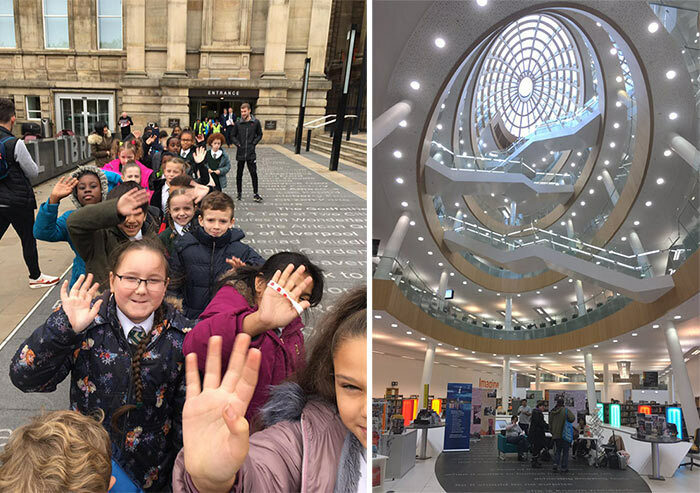 I picked this charity as my own charity to support because I can really see where the money goes, right into those mobile bookshelves and storytellers, for kids who will really appreciate them. 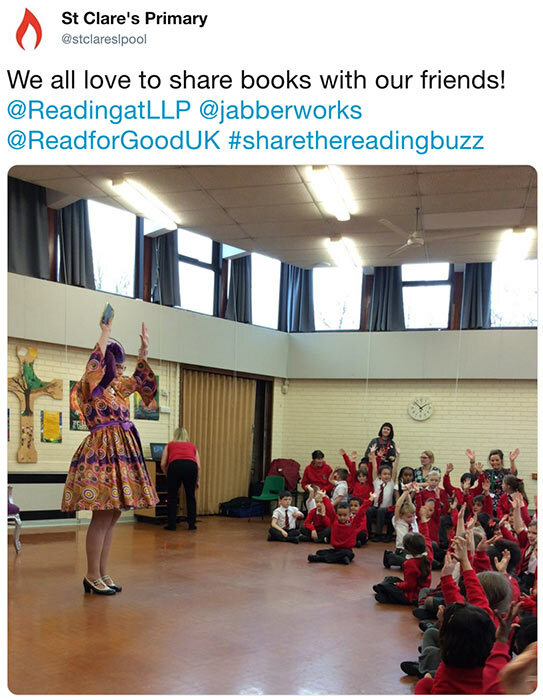 Find out more about Read For Good on their website. 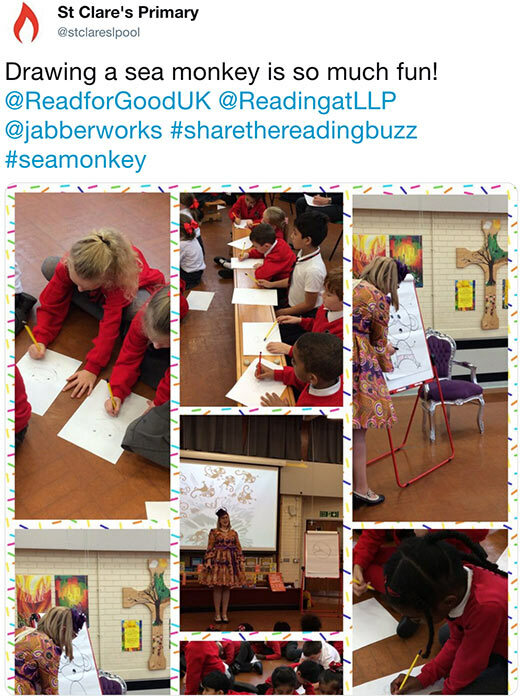 And if you want to run a Readathon in your school and get kids motivated to read, get in touch with them! 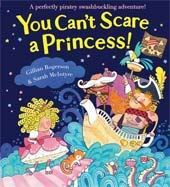 Books and stories for children in hospital from Read for Good on Vimeo.